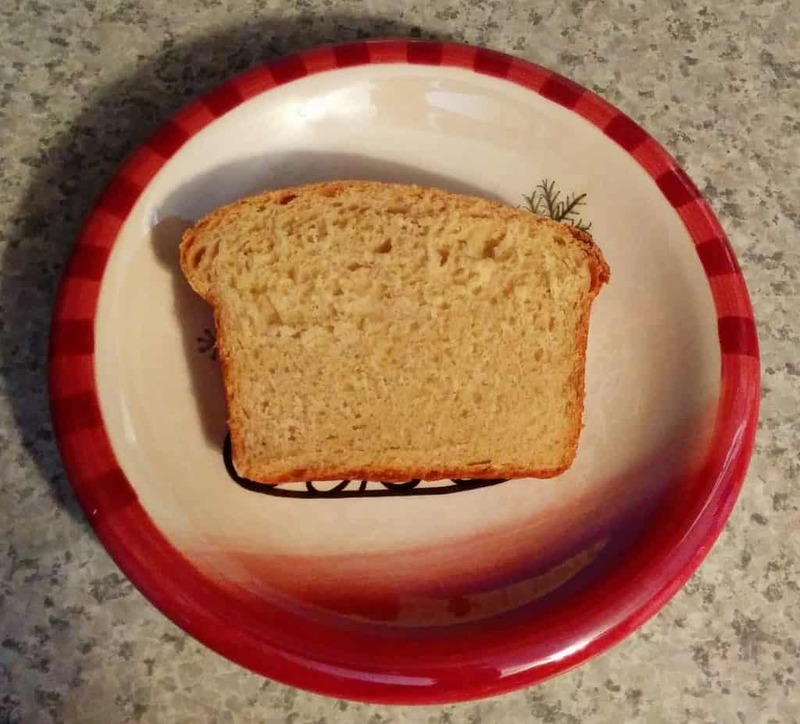 For Bread 39, and for the first loaf of bread I made at this new house, I decided to pull out another favorite of mine – Yeasted Banana Sandwich Bread. When you don’t like condiments or cheese (like I don’t), sandwiches on white sandwich bread are very boring. Thus, I’d never made sandwich bread before making this recipe for the first time in November 2011. However, this recipe promised to be perfect for toast or French toast, and so I found that I couldn’t really resist. Plus, it seemed to be an unusual way to use up those bananas that keep ripening before we eat them. 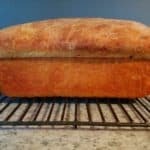 In the years since I found this recipe (originally from King Arthur Flour), I’ve made it countless times – more often than any other bread recipe by far. I make it any time I have an overripe banana in the fridge, and I prefer this bread over any kind of sweet banana bread any day. It’s so easy to make, and the results are so satisfying. Not only is this the banana bread that I always fall back to; if I make sandwich bread, this is what I usually make. It’s tender, moist, and a little sweet. 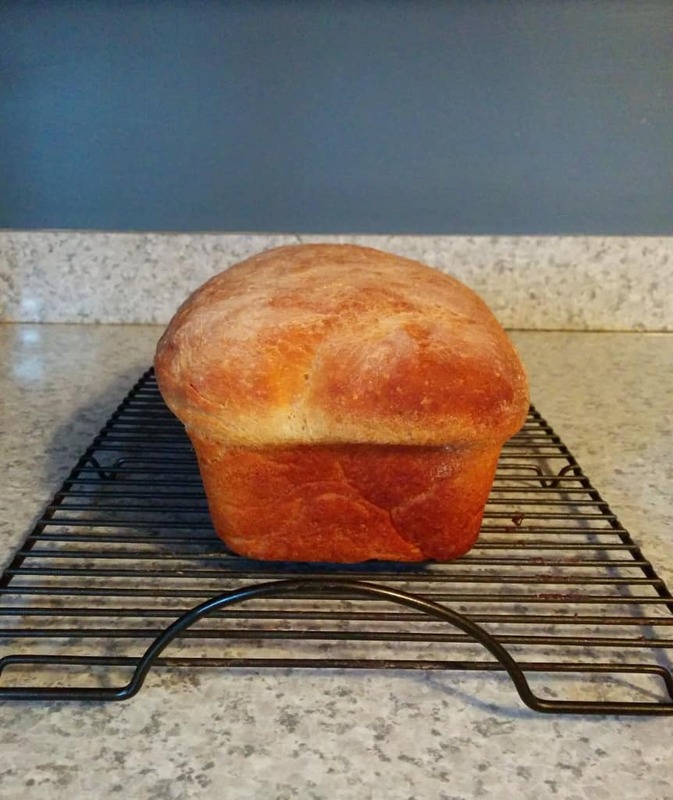 It’s a perfect loaf of bread for toast with raspberry jam, for a PB&J, or for French Toast. I generally use my stand mixer to make sandwich bread, although you can make and knead it by hand or in a bread machine. To be able to form a nice loaf of sandwich bread, you will need your bread to be tacky – not too firm and not too sticky. Think of how a Post-It note clings to your finger but doesn’t stick to it. If you have dough left on your finger after you touch the dough, add a little more flour. If it doesn’t cling to you at all, you will probably want to add a tiny bit of water. You can substitute up to a third whole wheat flour in place of the bread flour; if you do, your dough will not be completely smooth. To shape the loaf, you basically flatten the dough into a rectangle roughly the size of a sheet of paper on a floured surface. You fold it like a tri-fold letter. Fold the top third toward you and tuck the seam into the dough. Fold the bottom part up and over the rest of the dough, sealing it into the back of the dough. The top of the loaf should look tense and stretched over. I’ve definitely had to play with loaves, rolling them back and forth and folding them again to get that structural tension in the top of the dough. It’s necessary to get a good rise and crust. Once you have that, place the dough in the greased loaf pan with the seam-side down and let it rise, covered, until the top of the loaf rose 1 inch over the top of the pan. I’ve never particularly liked sandwich bread, but I think it may have been one of the most beautiful things I’ve ever baked. The top of the loaf puffed up like magic! The bread smells faintly like bananas if you have a nose that can tease that out. If you’re the kind of person who can’t taste or smell variations like that, I think it’ll just seem like bread to you. The bread was a little sweet, and didn’t taste like banana per se, but had a slightly fruity undertone to it. You wouldn’t want to make a roast beef sandwich with this bread, but it was perfect for toast with jam (or mango butter, which is what I had). It was tender, but seemed a little dense if you cut thick slices. Overall, I think this was a fun loaf of bread to make. It wasn’t difficult if you follow the picture instructions on the King Arthur Flour blog. It smells lightly fruity as you bake it, and it’s perfect for toast, which is basically all I use sandwich bread for. It’s an innovative way to use up old bananas when you get tired of traditional banana bread. 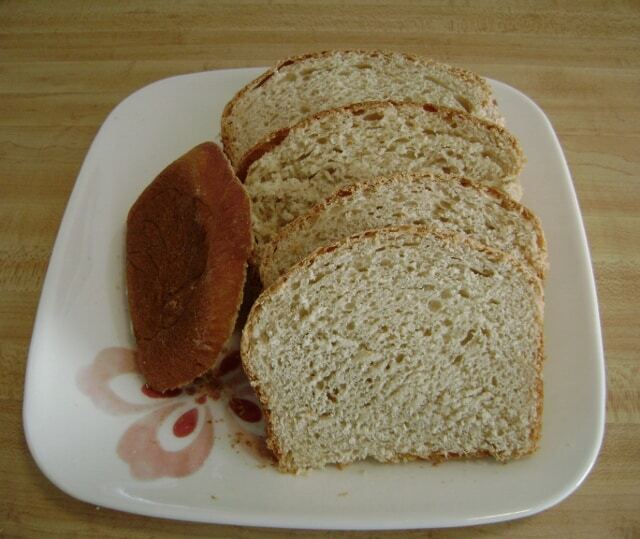 This bread is perfect for French Toast Peanut Butter and Jelly or Boston Creme Pie French Toast ! If you want more of a non-sandwich banana bread, try Banana-Raspberry Bread. My favorite sandwich bread. Slightly sweet, it's great for peanut butter and jelly or French Toast. It works well with a substitution of up to 1/3 whole wheat flour. Combine all ingredients in the bowl of your stand mixer and knead on medium with the dough hook for 5 minutes, until the dough is smooth and tacky. The dough will clear the sides of the bowl, but not the bottom. If mixing by hand, combine dry ingredients. Mash your banana, melt your butter, and combine with the milk and honey. 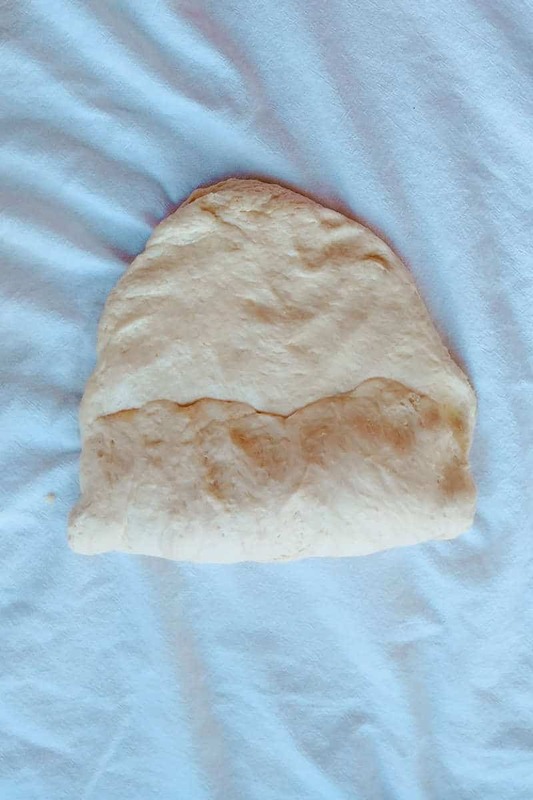 Stir liquid ingredients into dry ingredients until a dough forms, then knead (preferably in the bowl) for about 10 minutes, until dough is smooth. 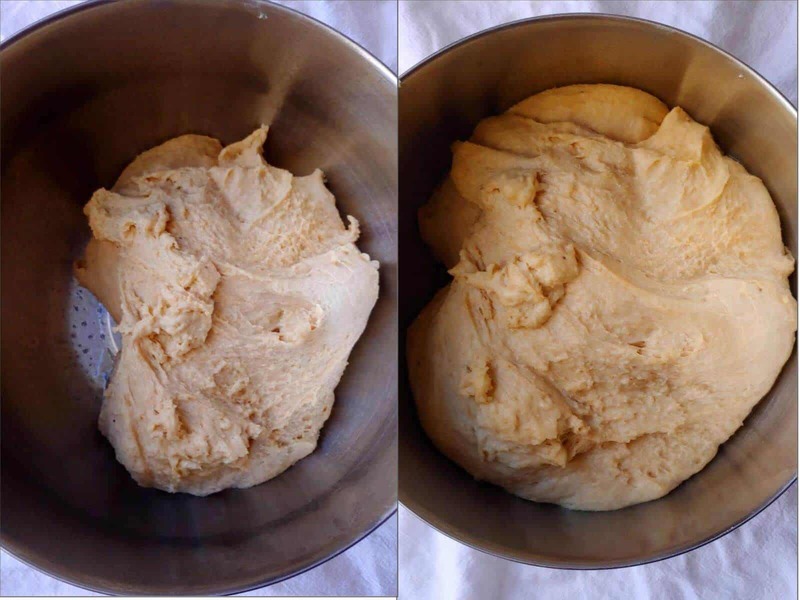 Place dough in an oiled bowl, cover, and proof in a warm place for 60 minutes, until dough has doubled in size. I usually preheat my oven for 1-2 minutes to create a warm space. Turn out dough onto a floured or oiled surface and pat into a rectangle. Fold like a letter to form a loaf, pinching the seams into the dough after each fold to increase the surface tension. Repeat if necessary if the dough is too slack. Place in a greased 8.5-x-4.5-inch loaf pan (although 9x5 is ok too). Spray with cooking spray, cover with plastic wrap, and let rise for another 60 minutes, until the dough has risen about an inch above the top of the loaf pan. Bake at 350F for 35-40 minutes. The temperature of the bread will be 190F if you take its temperature. Remove from loaf pan and cool completely on a wire rack before slicing. I can usually get 16 slices per loaf. One large banana, in my experience, weighs 120 grams without peel. With it, I usually add another 1/4 - 1/3 cup flour. If your bananas are small (75 grams on my scale, without peel), you can add 1 1/2 bananas. Or, you can add a single banana and add a little extra milk as necessary to make sure the dough isn't dry. I had some brown bananas so I decided to give this recipe a try. My son doesn’t like bananas but he still loved this bread. It was slightly sweet, but not banana-y. Delicious! I’m so glad that you tried this bread! It’s my absolute favorite on this website. It’s fantastic for French toast if you ever have any left over. I don’t have a bread machine (the one kitchen item I don’t have) so I have not. However, I know it works because Jenn makes it in her bread machine all the time.